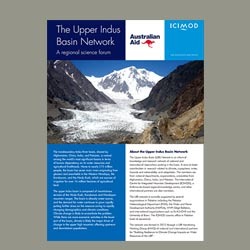 Upper Indus Basin (UIB) Network is an informal knowledge and research network of national and international researchers working in the upper part of the Indus Basin. It aims to foster coordination researches in climate, cryosphere, water, hazards and vulnerability, and adaptation related issues. 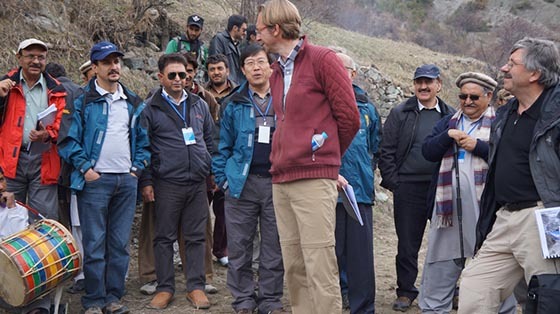 The members are from national departments, organizations, universities from Afghanistan, China, India, and Pakistan, and Kathmandu-based regional knowledge centre ICIMOD and other international partners. The UIB network is currently supported by many organizations in Pakistan including Pakistan Meteorological Department (PMD), Water and Power Development Authority (WAPDA), WWF-Gilgit Baltistan and international organizations such as University of Bonn, Ev-K2-CNR, etc. ICIMOD country office in Pakistan hosts as the secretariat. The network was formed in 2012 through a UIB Monitoring Working Group (MWG) of national and international partners for "Building Resilience to Climate Change Impacts on Water Resources of the UIB". The transboundary Indus River basin, shared by Afghanistan, China, India, and Pakistan, is ranked among the world’s most significant basins in terms of human dependency on its water resources and agricultural livelihoods. Home to nearly 215 million people, the basin has seven main rivers originating from glaciers and snowfields in the Western Himalaya, the Karakoram, and the Hindu Kush, which are sources of irrigation for over 16 million hectares of agricultural land. The upper Indus basin is composed of mountainous terrains of the Hindu Kush, Karakorum and Himalayan mountain ranges. The basin is already water scarce, yet the demand for water continues to grow rapidly putting further stress on the resource owing to rapidly changing demographics and climatic conditions. Climate change is likely to exacerbate the problem. While there are more economic activities in the lower part of the basin, climate is likely the major driver of change in the upper high mountain affecting upstream and downstream populations.